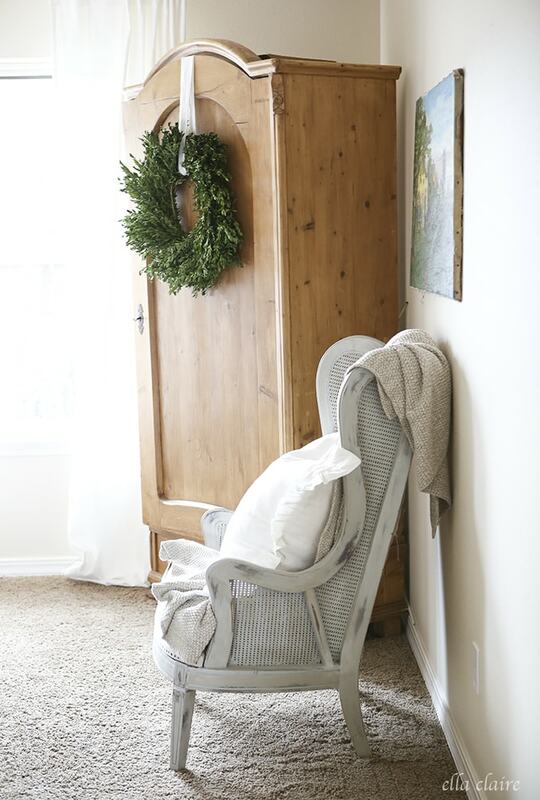 Between baby snuggles, I have been busy getting our home ready for Christmas, and I am so excited to share it with you today! I am honored to be joining in on Jennifer Rizzo’s Holiday Housewalk again this year and partnering with Joss and Main and Good Housekeeping. 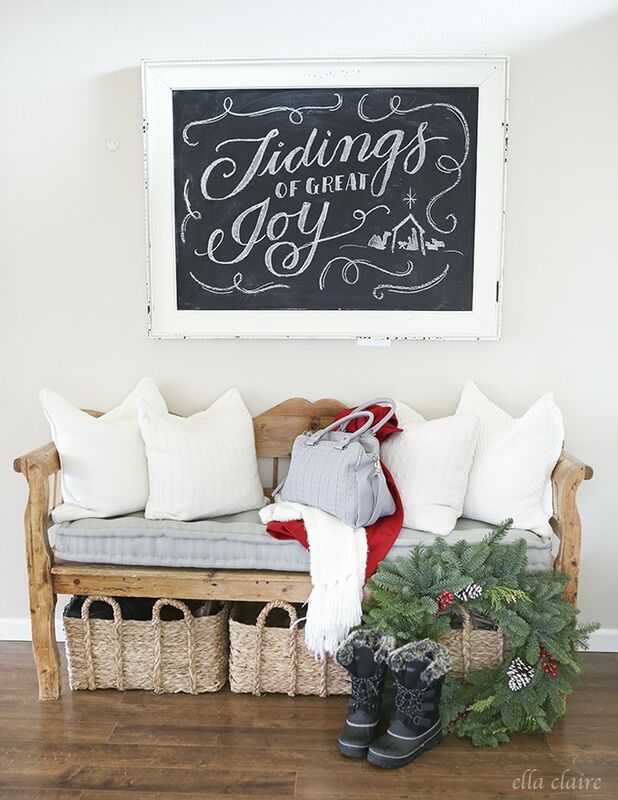 Christmas is my very favorite season, and I enjoy this week every year because I love seeing all of the festive holiday homes! If you are coming over from Unskinny Boppy, welcome! If you are just joining in, you can start the tour from the beginning by heading HERE to Jennifer Rizzo’s blog. 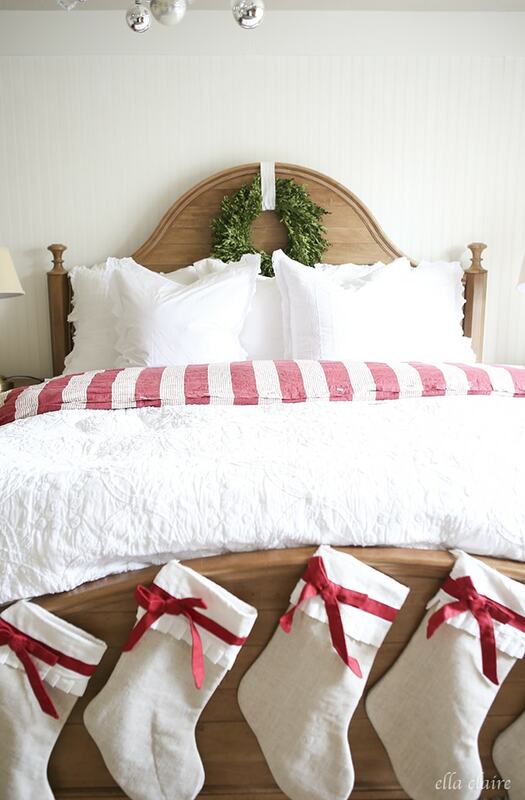 I love pops of red for Christmas, so you will see a lot of it in my home. This year, I used a lot of what I had on hand mixed with some fresh greens. 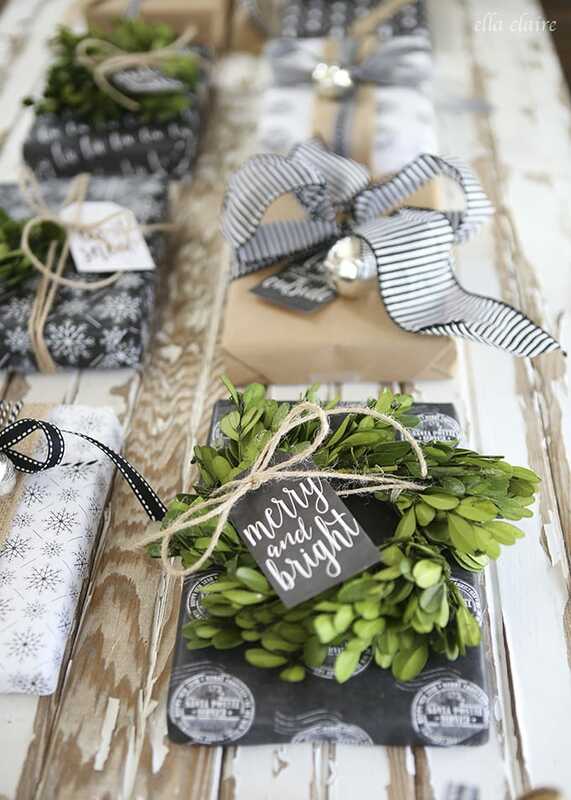 I tend to collect certain things for my Christmas decor, and I love to pull them out every year. 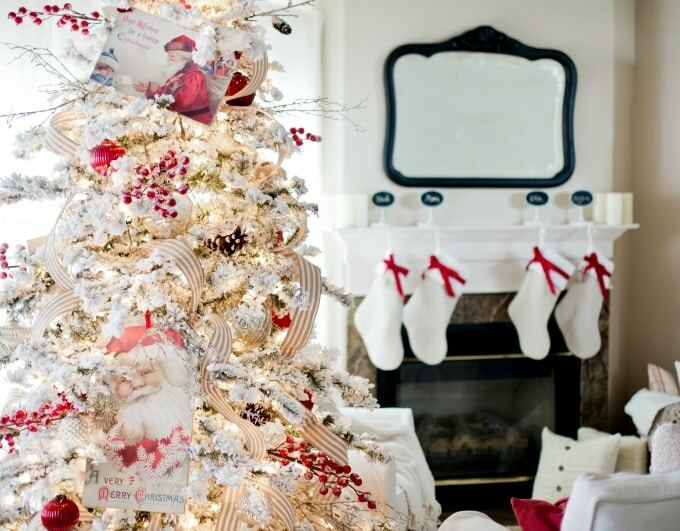 I decorate more with a classic Christmas style instead of following the trends and I use most of my decorations from year to year. I have a very open floor plan and there is already a lot going on in this main living space, so I kept the mantel really simple. 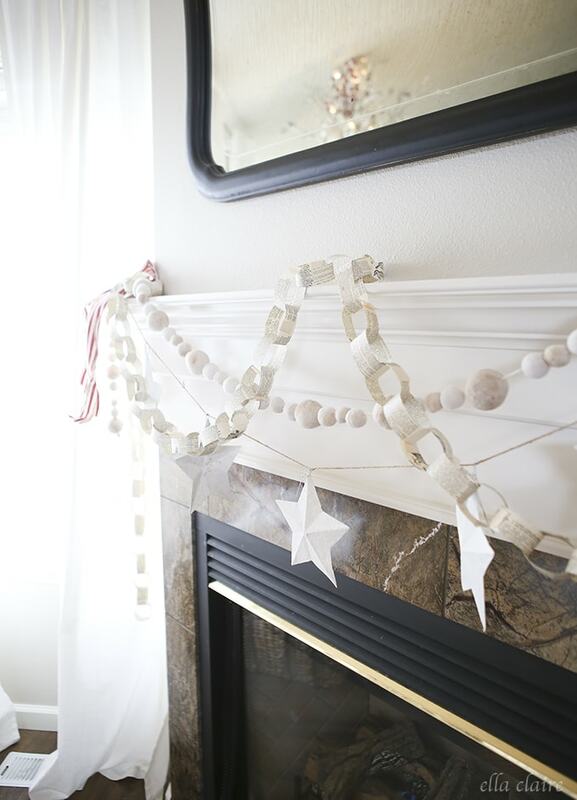 I made this bookpage chain to drape with a couple of other garlands for a simple festive Christmas mantel. I will be sharing more details, sources, and tutorials in the next week for the things you see in this post, so stay tuned! I draped a vintage European gathering cloth on the back of my couch. 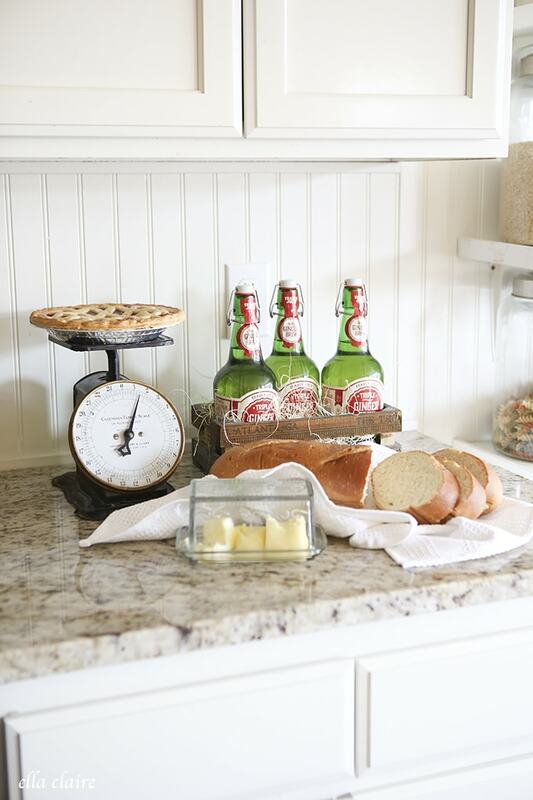 I loved the red stripe and the nubby grain sack texture. My Christmas tree is really similar to last year. I added a few new mercury glass acorn ornaments from Joss and Main, but everything else is pretty much the same. I added my vintage rocking horse under the tree, and now we just need to add the presents! Doing dishes with this view is definitely a lot more enjoyable. Well, just a little. My kitchen is definitely the busiest room in our home, so it only looked like this for about 5 seconds. I had kids running through here shortly after I took this picture. And I love every minute of their giggles as they run by. I found these cute bottles of Ginger Ale at Trader Joes and I thought they were so festive! I like cake plates… 🙂 and bread boards of course. 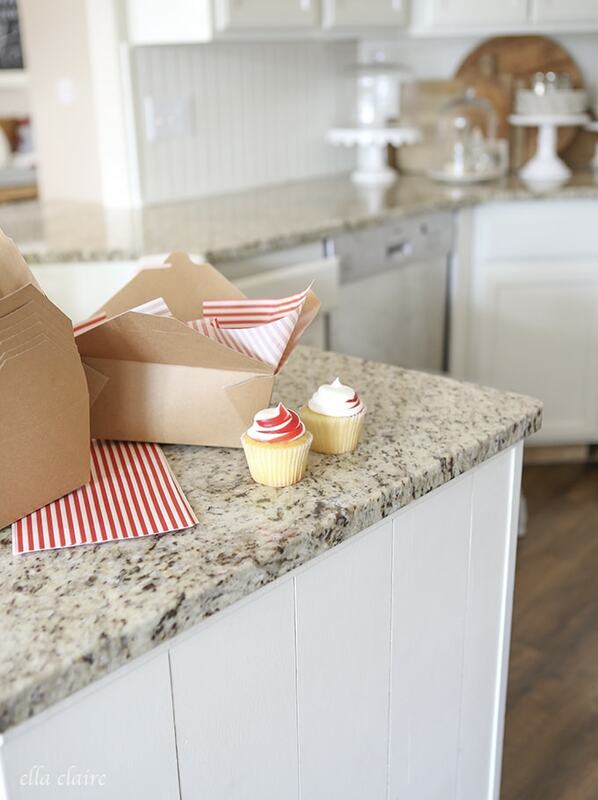 During the holidays, I always keep these to-go boxes on hand to send leftovers and treats home with people. I buy them at a local restaurant supply store and I actually even use them for small presents. 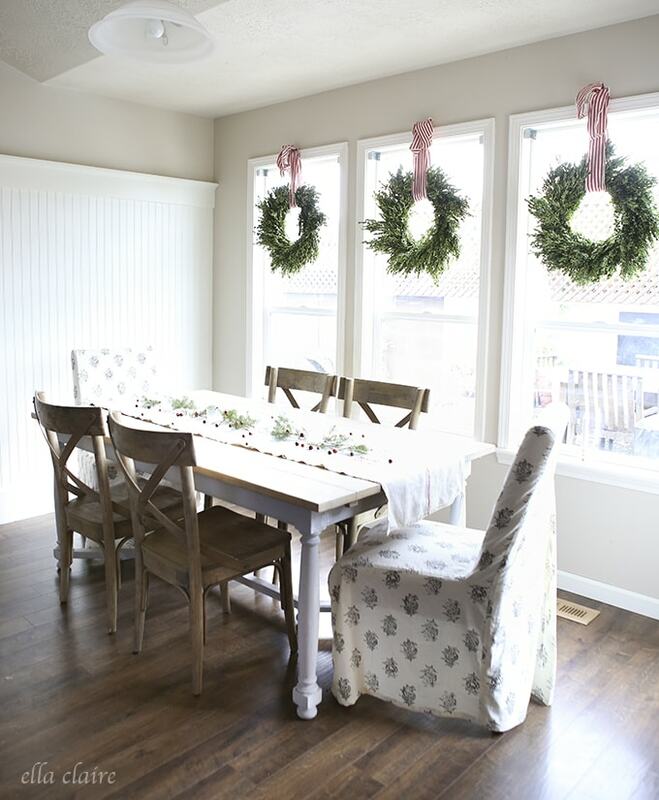 Swinging over to the dining room, I kept it rustic and simple. 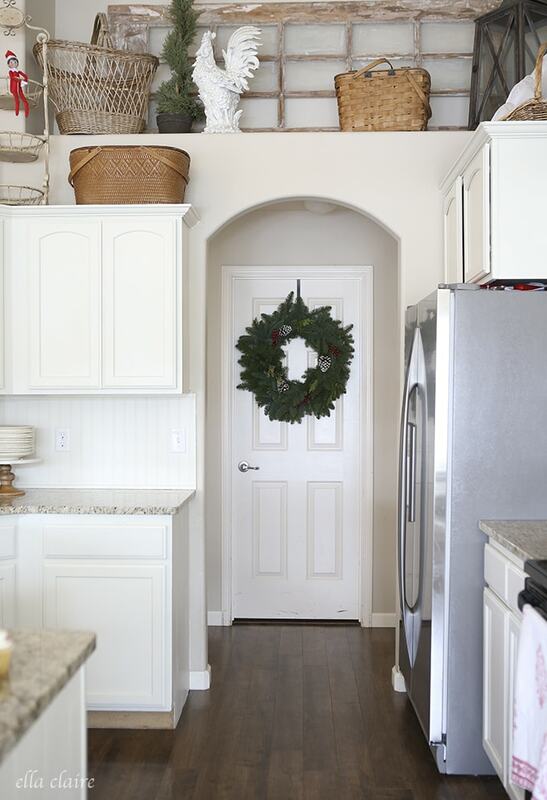 I hung wreaths in the windows with my favorite red and cream striped ribbon. 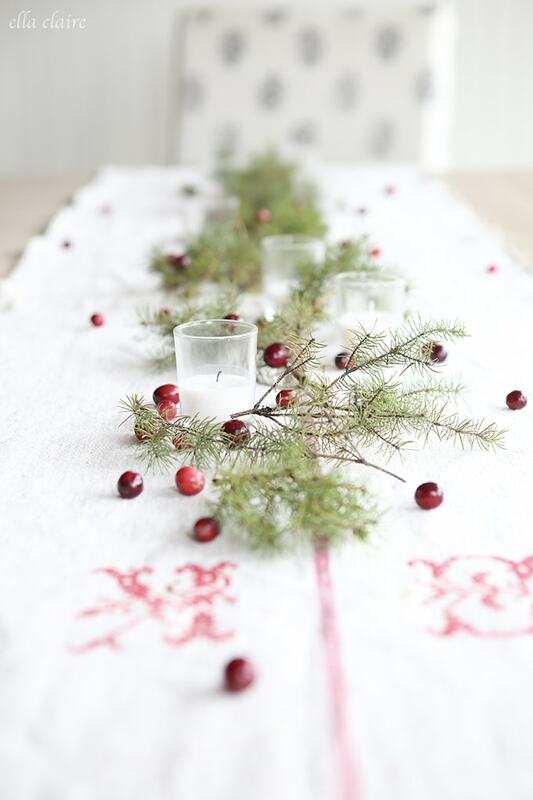 I used a vintage grain sack that I had pulled apart as my table runner with greens (from the trees in my yard), cranberries and candles as the centerpiece. I wanted to add a little Christmas touch to each of the kids’ rooms too. In Ella’s room, I put her usual little white Christmas tree, and as you can see, she decorates and redecorates it constantly. She is her mother’s girl! I have been working on finishing Ella’s room, and I can’t wait to share the full reveal with you… after I get the curtains hung. My sweet little baby man turned 2 a few weeks ago and officially was moved to a big boy bed. We needed his crib for the new baby anyway so it worked out perfectly, but I was still teary eyed. Why do they grow up so fast? 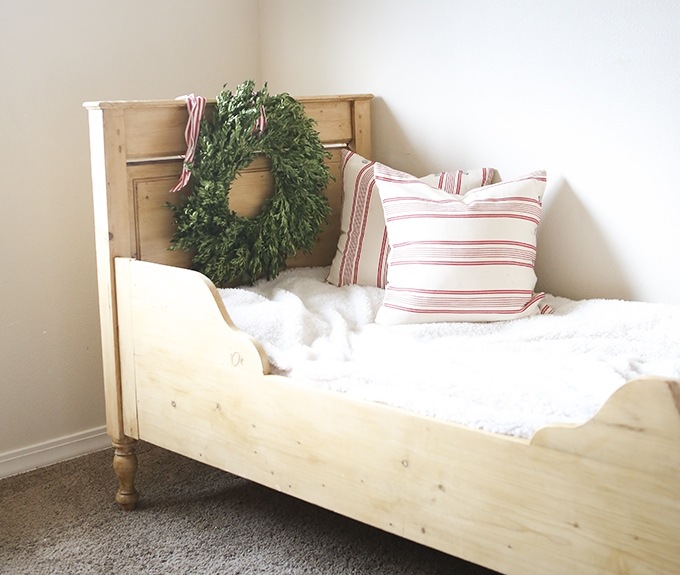 The only thing that made me feel better was that we could finally use this adorable little antique pine bed I found. Of course, the wreath didn’t stay on the bed since he would have used it as a football, but it was so pretty for one afternoon! 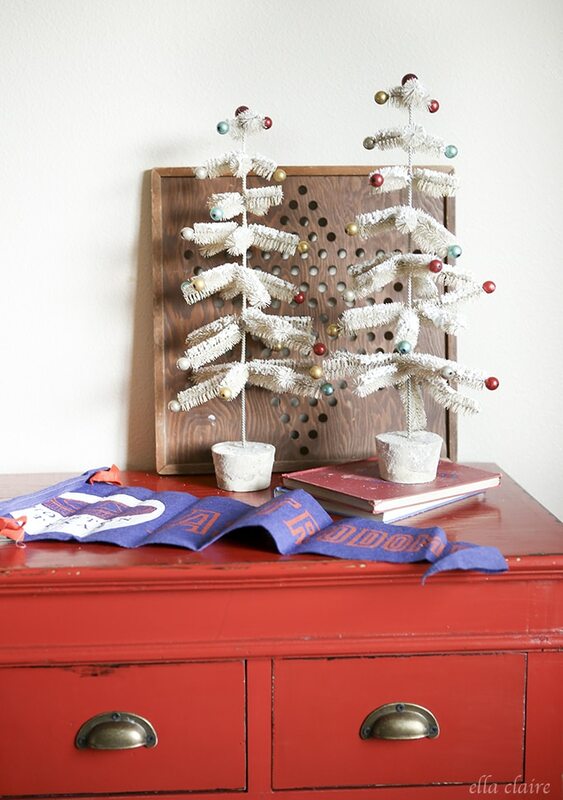 On his dresser, I added these ADORABLE mini sisal trees from Joss and Main. It was so horribly dark when I took all of these house pictures from the storms we have had, but these babies are so cute in person. 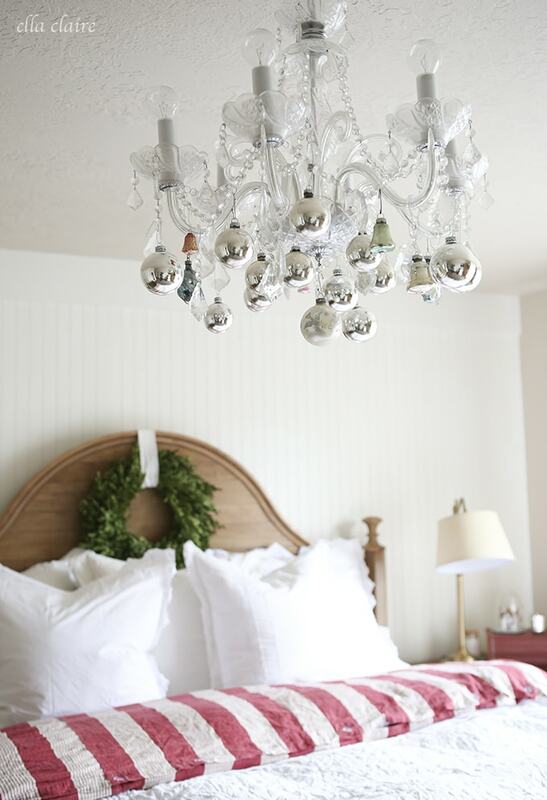 In our bedroom, I had to add a little Christmas sparkle as well, and I will be sharing a bunch more in the next few days. 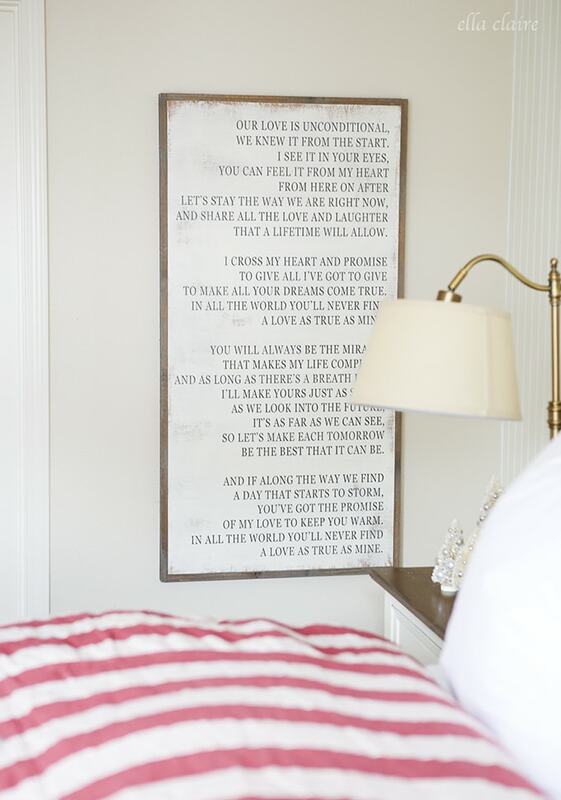 This room got an entire makeover, and I can’t wait to share all of the details with you! I still love this sign from Between You and Me. I need to find a rug for the floor in here too. 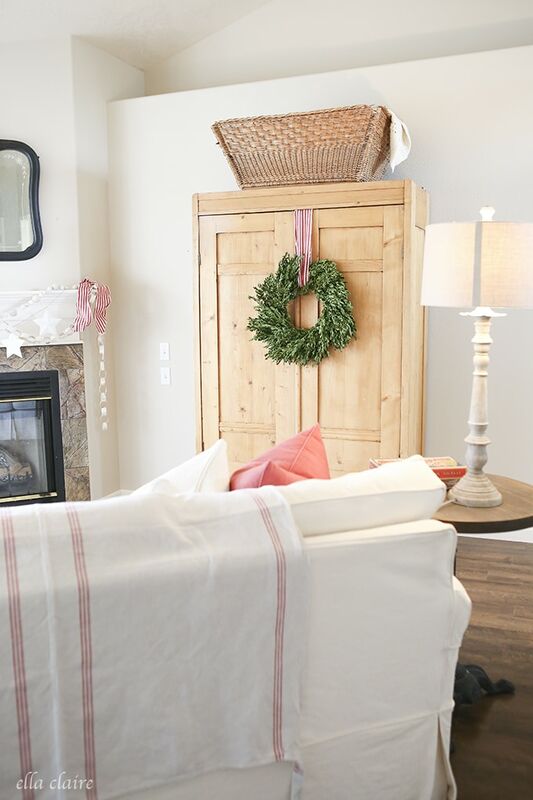 This beautiful bed is from Joss and Main. 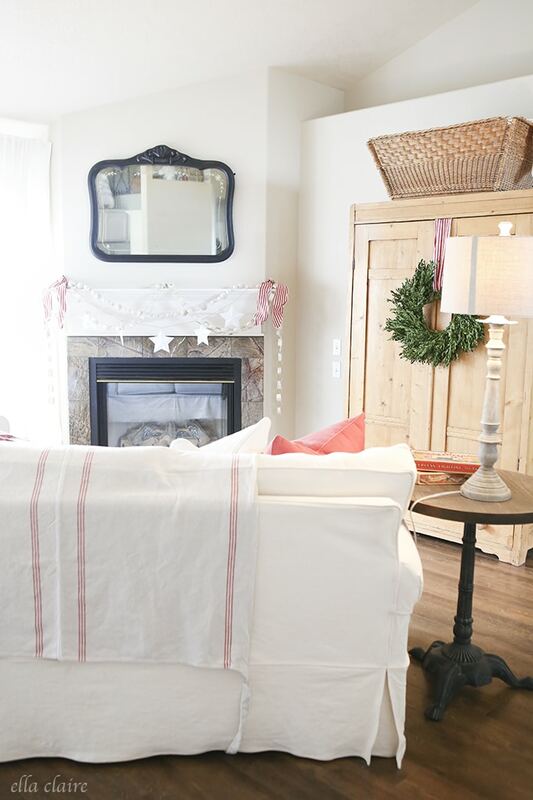 I have had my eye on this bed for well over a year, and when I found my antique armoire with the beautiful arch, I knew I had to have the bed to match. Actually, my sweet friend found the armoire, but I will tell you that story later. I hung our stockings on the end of the bed and I think they are so cute. 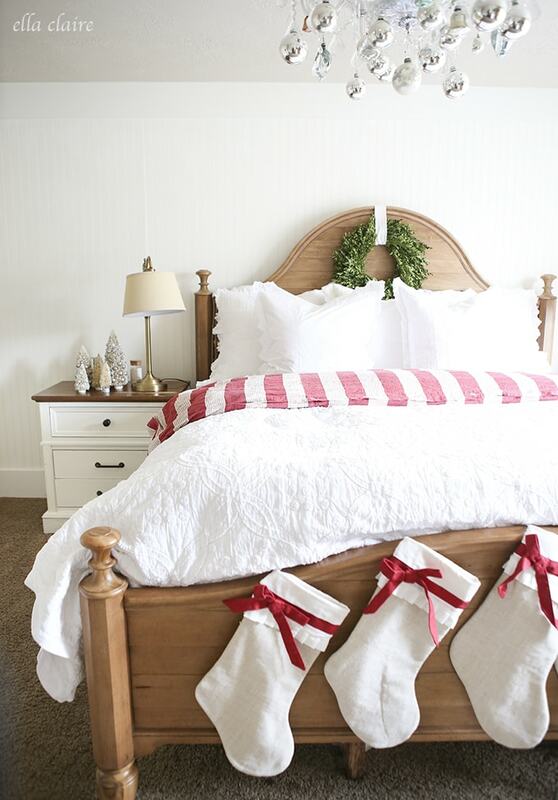 These pretty stockings, as well as the cozy throw above are from Birch Lane. I will have so many more details in the next week, so stay tuned! Heading upstairs, I decorated my other flocked tree with a few extra sparkly, winter-wonderland-y (it’s a word) things this year. 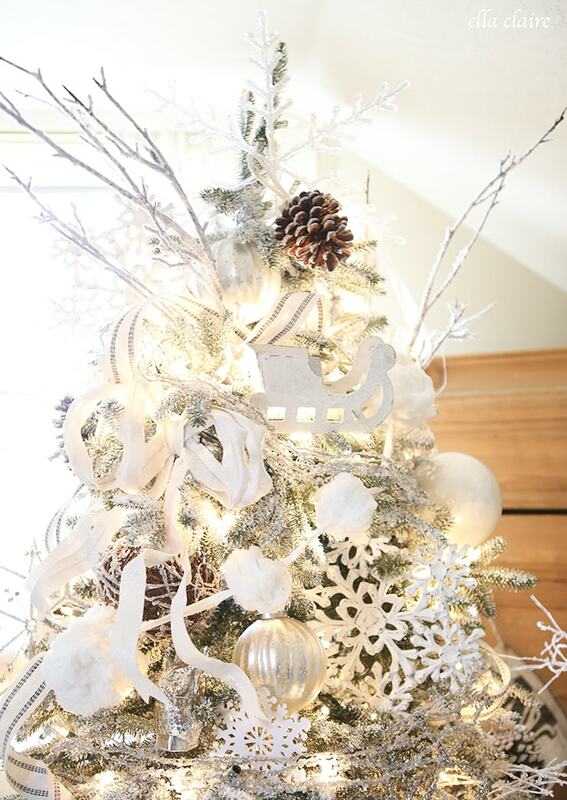 I love how all of the white and sparkle just glow. Heading out the door, you can see my other chalkboard. I will have more details and sources to come on the blog in the next week or so. A little reminder of the reason for the season. I just want to thank you from the bottom of my heart for all of your love and kindness and support. You mean so much to me and I am constantly humbled and grateful for your uplifting words. 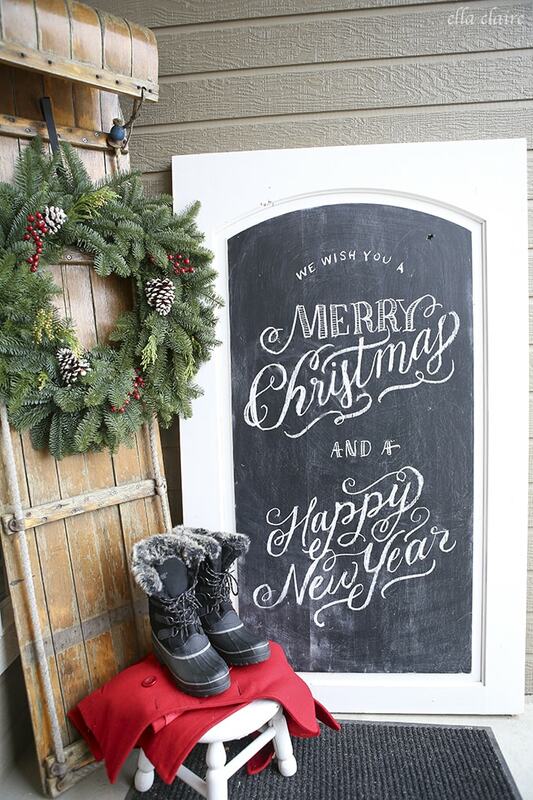 From our family to yours, we hope you have a wonderful and very Merry Christmas. 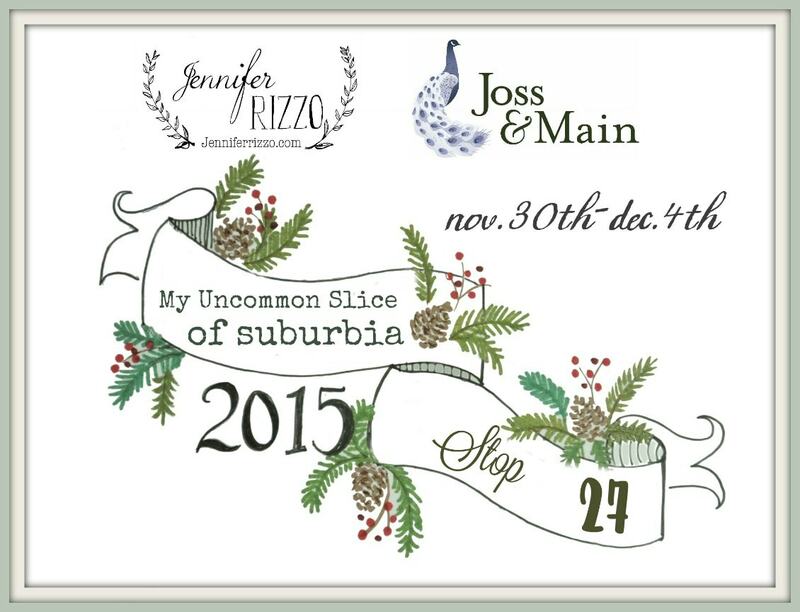 Next stop on the tour is My Uncommon Slice of Suburbia! Kristin always has such a beautiful home. 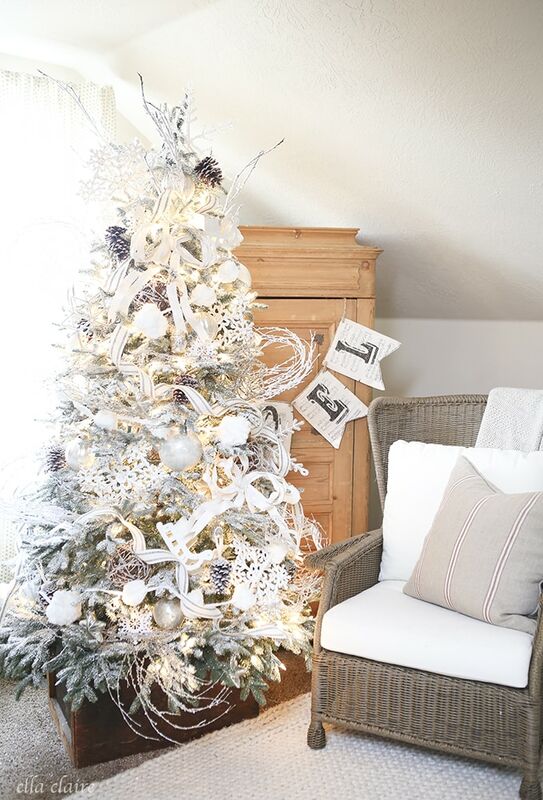 And for even more Holiday inspiration, be sure to check out GoodHousekeeping and our GoodHousekeeping Pinterest board! Thank you so much for sharing your home with us. I absolutely adore your style. Everything is simply gorgeous. 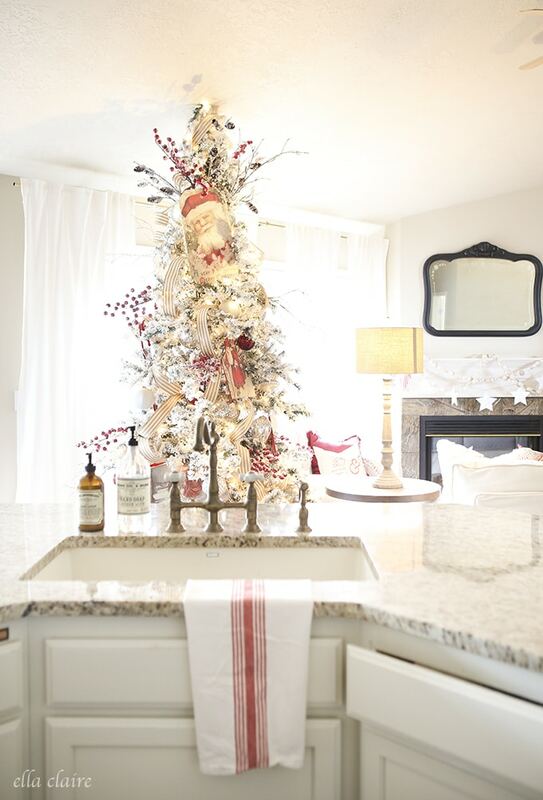 Your home tour is one of my faves to watch for each year. I always love the traditional red and the winter wonderland tree. 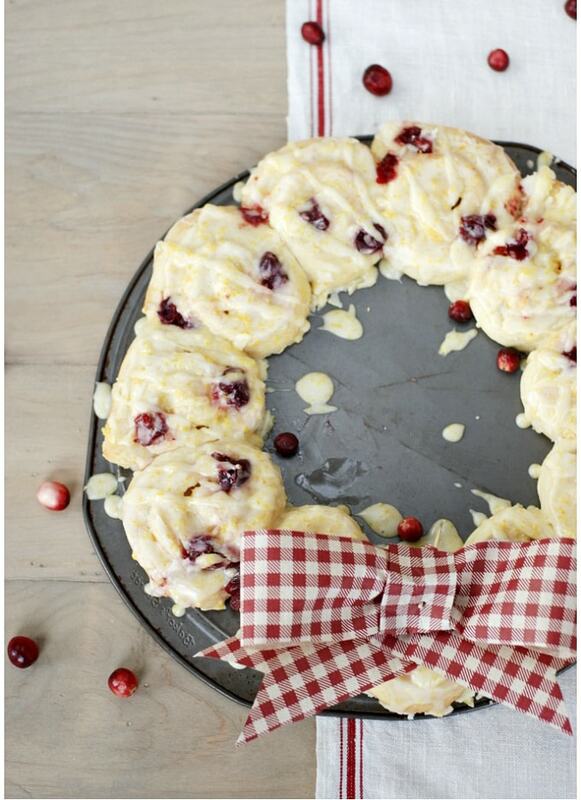 I started using some cranberries this year for decorating and I love the look. 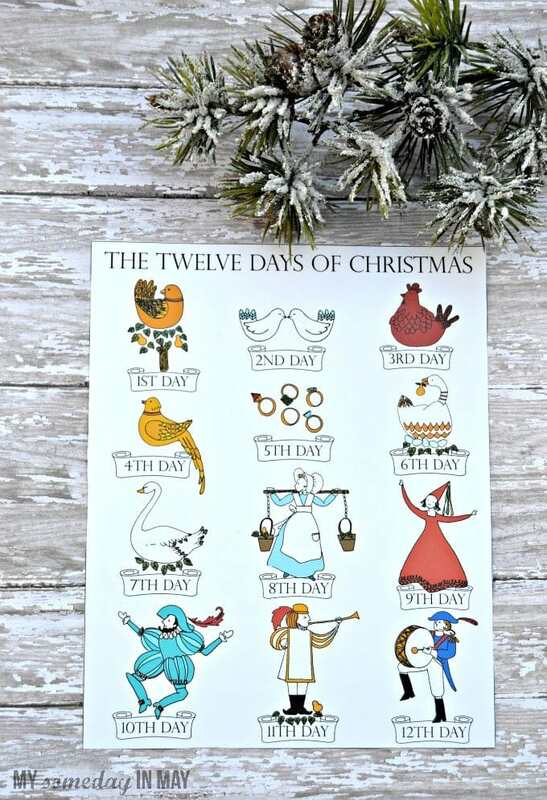 You Christmas card is just beautiful. I know you are feeling so blessed this year. Have a Merry Christmas and enjoy the holidays with your family. I also was wondering if you happened to have a list of the interior paint colors you have used in your home. I love them all… So soft and pretty. Thanks!! it’s beautiful as always! 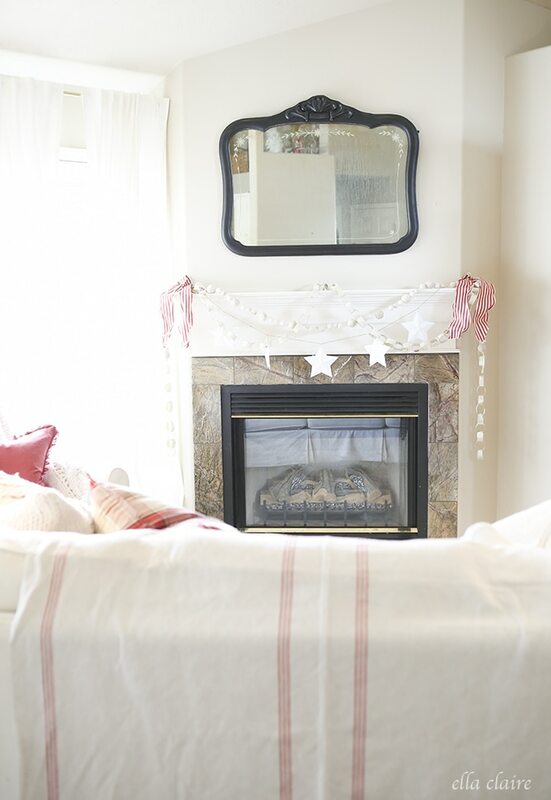 i always enjoy your home and photos- the mantle with the stars and paper chains is my favorite part, but i love it all! i have a grainsack i have been meaning to pull apart as a runner and i haven’t made the time yet- but i am inspired now! Kristen, as always, just beautiful, gorgeous, delightful, splendid! I absolutely love your bedroom. Your Christmas tour is one of a few that I eagerly look forward to each year, and once again, you did not disappoint. I hope you and your beautiful little family have a warm, wonderful, and merry Christmas! Your home is gorgeous…but even as beautiful as it is, it doesn’t hold a candle to the beautiful children you created! Such a sweet picture! 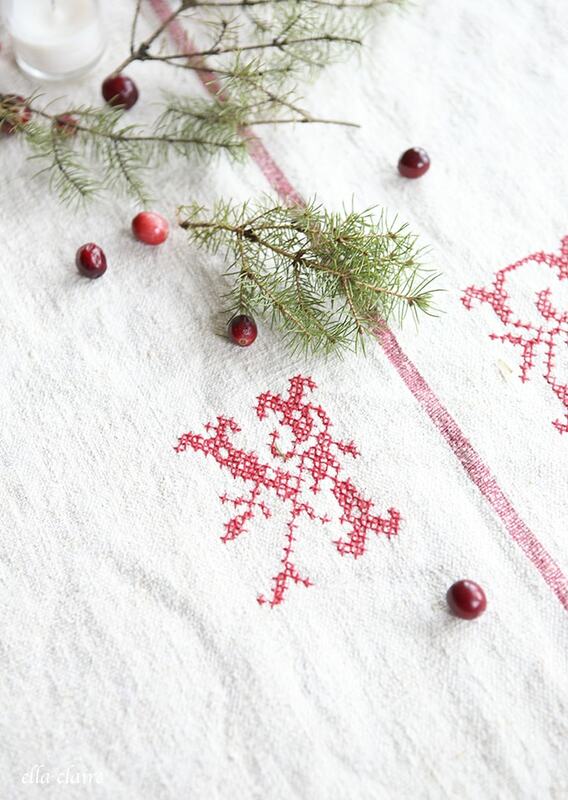 Thank you for sharing all the Christmas loveliness! Kristen, your home is beautiful and your family is precious!! Your home looks beautiful! Thank you so much for sharing it on the holiday house walk! Precious home, family, and thoughts. 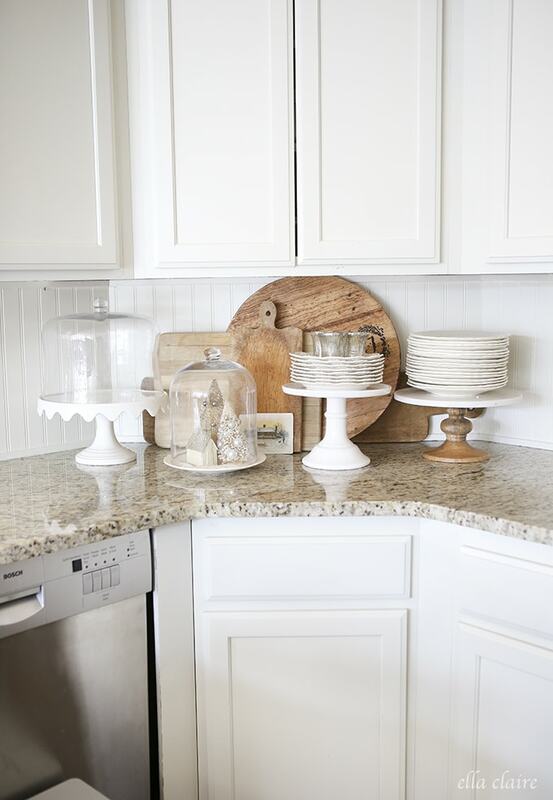 Always love your sweet blog and beautiful home! Merry Christmas!! 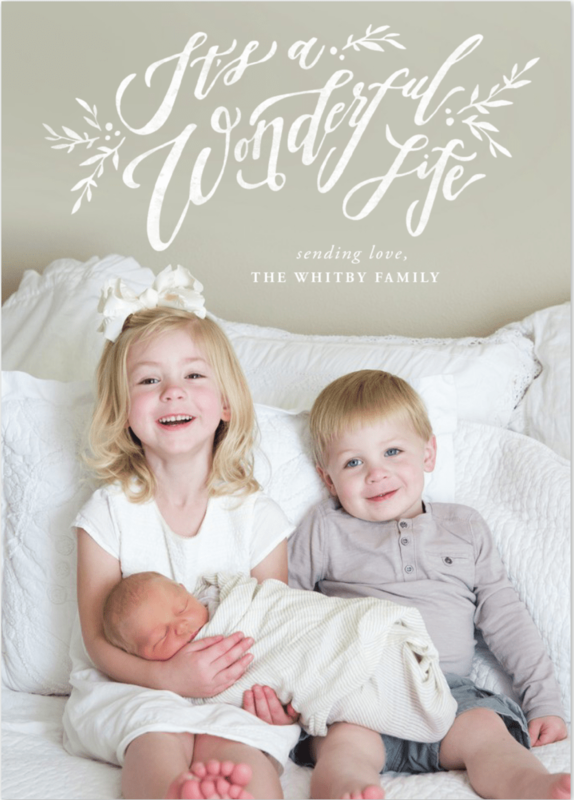 Your home is perfection, but the pic of the children totally steals the show. Gorgeous! I’m in love with every little detail! Great job! hey girl- I love your house!! So pretty and the trees are so gorgeous! and the pic of the kids is so darling! Those babies are adorable!! You have been a very busy mommy, my dear. The house is stunning and I love your trees. What a creative mind you have. It looks so simple and clean, yet opulent and elegant. Well done you!! Simply beautiful what an amazing job. 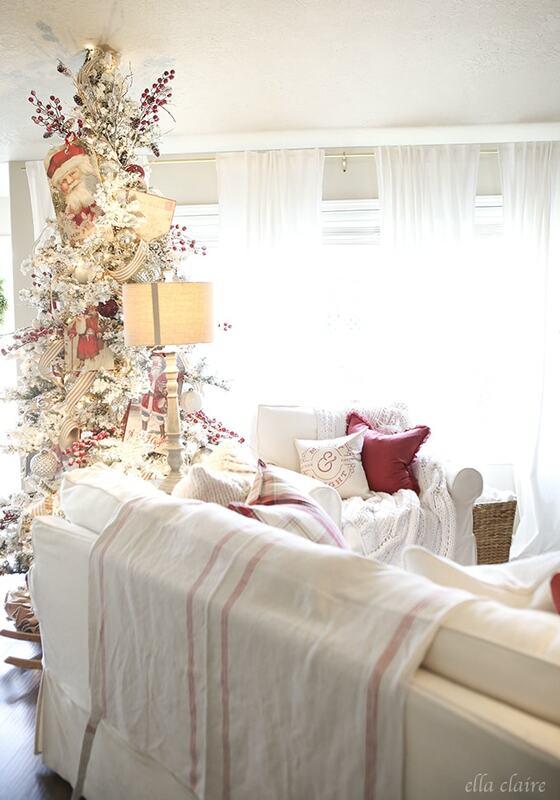 This is the perfect Christmas house. I love everything you did. It is perfection to say the least. Those babies of yours are just perfect. Thank you for sharing my heart is now full. I SO enjoyed a peaceful few minutes early in my work day as a general contractor in the Seattle area. Have recently & gleefully “tripped” into your blog & appreciate your humble & homey & beautiful aesthetic. Today I’m curious about your living room floors, Love the color. Hardwoods or laminate? Source? The Christmas photo of your adorable children is a real treat ~ (can’t believe you got them all dressed in their Christmas Splendor, hair brushed, faces AND clothes clean, smiling & sitting STILL all at the same time! Complete with a brand new baby?! IMPRESSIVE!). Congratulations on your beautiful family & I wish you all the happiest & healthiest Christmas & New Year. Beautiful as it always is. You always inspire ! Those three kiddos are the cutest ! Precious picture of them. The house and fam look great! Happy New Year. Have a question about your tree. Is it real? Did you flock it? 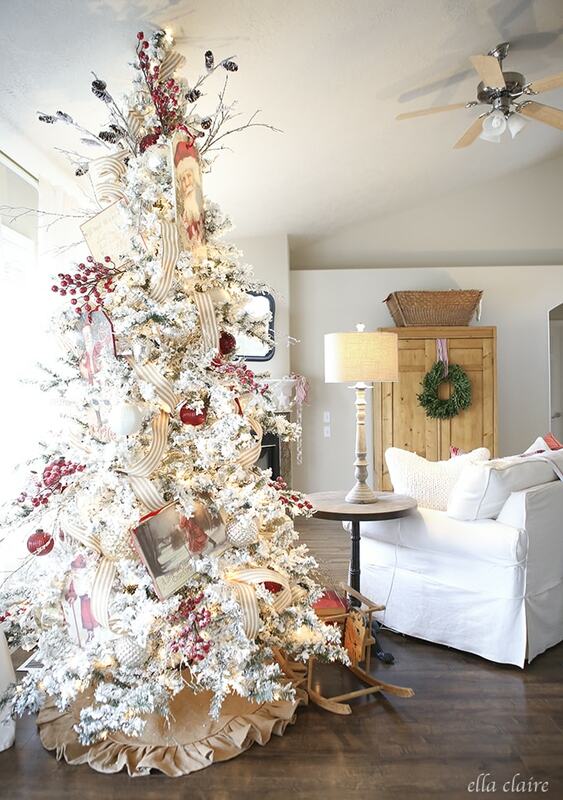 How would you store an imitation tree that’s been flocked? I want a tree that looks like yours, but I see so much info, I don’t know what to think. And I don’t want to ruin a perfectly good imitation tree by messing it up. What do you think?